I love using sketches, especially when I scrapbook. They are a great starting point. Sometimes, I will stick to the sketch, other times it just gets me started and I end up with something completely different. 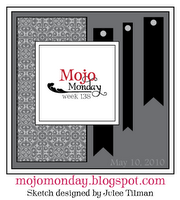 The Mojo Monday card sketches work wonders for scrapbook layouts with just one or two photos. Check out what I did for this weeks Mojo sketch. It's hard to see from the photo but the Real Red cardstock in behind the photo is textured with the polka dot SU! Backgrounds texture plate, then a little shimmer was added using our new Vanilla Shimmer Smooch Spritz. I hope to have a few more layouts with photos from our trip to share with you over the next few weeks. I've decided to try something different - I'm going to scrapbook my whole trip over the next few weeks (well probably months). 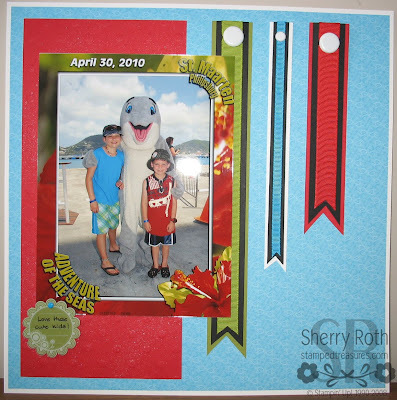 I normally don't scrapbook by theme or even chronologically, I scrapbook what I'm in the mood to scrapbook. I have albums full of wonderful pages but none of the albums are completely finished, apart from Eathan's baby album. So I'm going to try just focusing on this one trip and scrapbook the entire thing! I'll post my pages as I go along... wish me luck! Cardstock/DSP: Whisper White 12x12 (106529); Pink Flamingo dsp (113976); Real Red (102482); Old Olive (100702); Basic Black (102851). Accessories: Seasonal Pieces printed window sheets (115706); 5/16" Neutrals brads (112534); 5/8" Neutrals brads (112533); Bold Brights brads (106957); 5/8" Old Olive grosgrain (109054); 5/8" Real Red grosgrain (109052); 1/4" Tempting Turquoise grosgrain (109038); Scallop circle punch (109043); Vanilla Shimmer Smooch (118772).